Show off your photos anywhere with our easel canvas prints. With gallery wrapped edges, they add a sophisticated flair to your end tables, shelves, or walls. They’re also printed on genuine artist canvas to bring out the best color, contrast, and clarity. Update any drab corner of your home by browsing your photos and printing them on canvas today! Want to hear about other canvas options? Check out our photo canvas page, where we list all of our sizes and styles. Order large wrapped canvas prints, or framed photo canvas and more. When building your canvas, you can choose between gallery wrapped and museum wrapped edges. 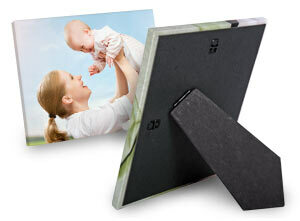 Gallery wrapped edges allow your photo wrap around the sides of your print for a classic look. With museum wrapped edges, choose a custom color for your edges to accent your photo and interior décor. Besides photo wrapped and color edges, you can customize your cropping by moving your photo around in the canvas maker. Just center your photo’s subject until you’re happy with your canvas’s layout. You can also add text if you wish to include names, dates, or captions to describe your photo. Wrapped canvas art is perfect for any home, whether you’re decor is traditional or contemporary. Gallery canvas prints never go out of style and have a timeless look that adds sophistication and elegance. We have several sizes you can choose from that let you display your favorite photo almost anywhere. 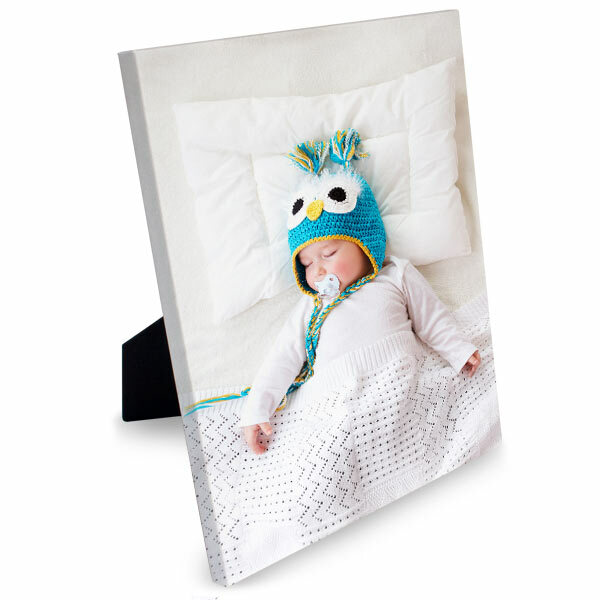 Order a 5×7 canvas print of your baby and display it on your mantle. Or upload your favorite pet photo and print it on an 11×14 canvas to hang on your wall. All easel canvas art has both easels and hanging hardware so you can display around the house. Add a little character to your kitchen counter. Use a favorite wedding photo to liven up your bedroom nightstand. Or, upload your best family portrait and create an 11×14 canvas that you can display on your mantle or hang on your wall. The possibilities are endless! You probably have many pictures from your phone or camera that are worthy of display in your home. At Print Shop, you can upload your photos in minutes and create a canvas that commemorates your best moments. Keep your memories close while adding a touch of personality to your dining area or rec room. Maybe you have a cute picture of Mom you took on Mother’s Day, or a graduation photo of your son that you saved to your phone. These are important moments that need to be celebrated! Create your own keepsake by printing your photos on canvas for display year round. You can also make canvases for seasonal décor! Choose your kids’ best Halloween photo and create a canvas to display in the fall. Or, use your best family holiday photo to make a canvas that you can put out every Christmas or Hanukkah. Gather pictures from various occasions and make canvas prints with seasonal photos to change up your décor year round! Create the perfect gift that for anyone on your shopping list. Instead of shopping around at nearby stores, make them a custom easel canvas that they can display anywhere. If you just can’t figure out what they’d want, you’re safe in knowing that they won’t have a custom photo canvas of their own! For Dad’s birthday, why not upload a picture from your fishing trip together and use it to create a canvas that he can set on his desk at work. Or, if your Grandparent’s anniversary is coming up, upload your favorite picture of them and make a gift that commemorates their important milestone. Canvas photo prints are a gift that won’t disappoint, no matter who you’re shopping for. If you’re looking for quality and convenience, you’ve come to the right place! Designing your canvas online takes only minutes. Upload your photo, choose a canvas size, and then select your wrapped canvas edge option to tailor it to your liking. Afterwards, leave the rest to us and have your photo canvas delivered right to your door. Not only are they simple to make, our canvases are printed with the highest quality inks. We also offer the cheapest canvas prints online so you don’t have to sacrifice quality for affordability. If you have a series of photos, why not print them all on canvas to decorate every room in your home! With so many custom options, low prices, and our easy-to-use canvas builder, you can create the perfect wall art to display your photos on canvas. From little league pictures to photos from your July 4th picnic, you can feature them all on quality canvas prints that never go out of style. Our easel back option is totally versatile since they can be showcased on tables, shelves, and walls. Photos are a window to the past and let you relive your favorite moments! So gather up your photographic treasures, and use them to create keepsakes that you can enjoy year after year.